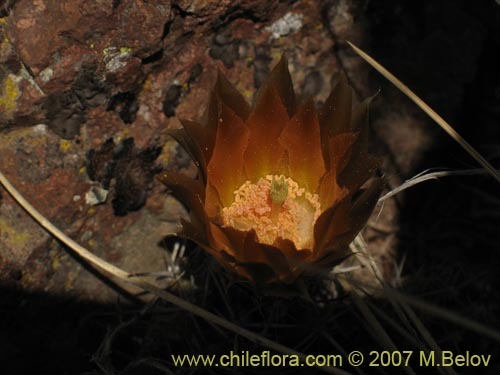 This is one of the most rare and amazing plants in Chile. Only two locations are known where it can be found, and the last location was discovered just recently by the University of Talca. It seems that the first location was plundered, because there were no reports of seeing it there lately. So the newly discovered location may be the only one where it is known to be. On the other hand, this cactus is so well camouflaged that it is very difficult to spot; so, unless you sit on top of it, you may never discover that it is there. Finding new locations are therefore extremely difficult. Only when it is blooming there is a real chance of finding it. 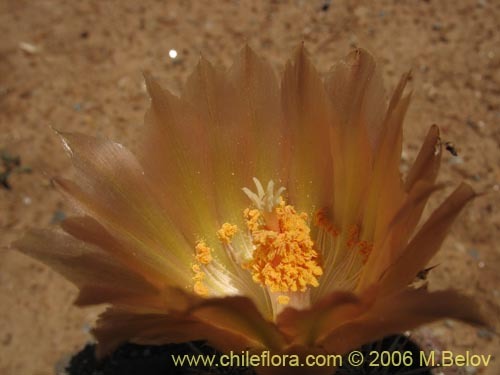 This cactus, apart from being one of the rarest, is also one which is most cold-resistant. It forms groups of about 6 - 12 plants; it has a columnar body, with somewhat soft, green tissue, generally short, erect stems about 5 - 20 cm. long and about 3 - 4 cm. in diameter, some stems may also be prostrate. 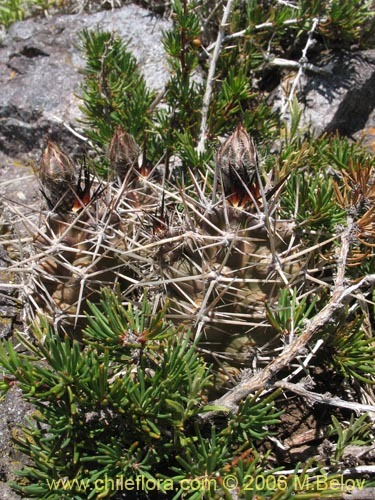 It has 7 or 8 prominent ribs, 6-8 marginal thorns, and 3 - 4 central thorns of up to 3 cm. long. The flowers are about 5 cm. long, yellow-orange-brown, and the blooming season is from the end of December through January. It lives just in one specific location in the 7th Region, at an altitude of 2000 m. (location 1) and 2200 m (location 2). It seems to prefer flat, but rocky areas, exposed to sun. The soil where the roots are growing has a considerable organic matter concentration, despite the fact that the superficial soil around is rather barren. 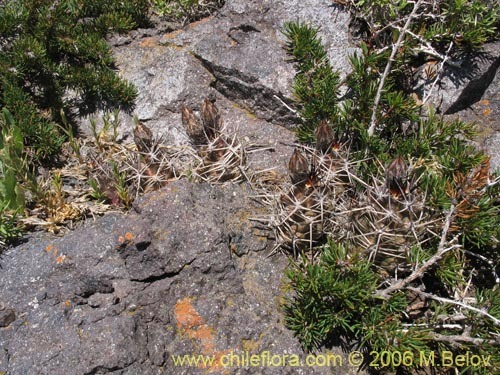 It forms a community with Mulinum spinosum, Ephedra chilensis and Berberis empetrifolia. Despite the fact that it grows in a very open location, its light requirements are probably average, because in summer due to thunderstorms it would get direct sunlight only in the mornings (for about 5 - 6 hours); in the afternoon it is protected by clouds. The temperature regime in summer is: max. 20º C (at noon), min. 0º C (at dawn), with occasional freezing temperatures possible. In winter, the temperature would oscillate around -5º under snow cover, with a range of -15º - 0º. As of now, it does not have any known uses, but it certainly can be ornamental. 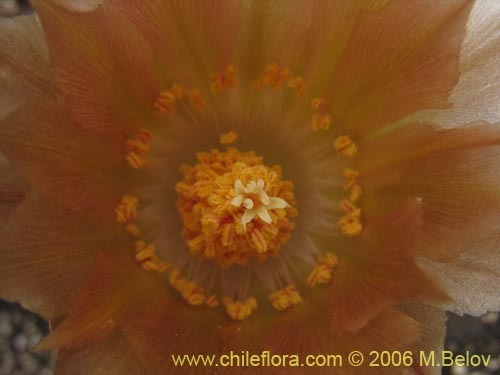 As such, it has a very strong potential, because it can be easily grown outdoors in rather cold climates, like Central Europe - its ability to withstand snow for 3 to 4 months and freezing temperatures of up to - 15º C makes it unique among the cacti. No information is available so far; however, it seems that exposing it to high temperatures will definitivly kill it, so for warm and hot climates with over 25º C a plausible alternative would be to provide forced cooling during the hot period. Another alternative for the countries with hot summer season would be to hibernate it in refrigerator (this should be almost certainly Ok, because in nature it is covered by snow for about 4 months with no light at all) during the summer time and use the spring/winter/autumn for vegetative growth. Austrocactus philippii (Regel & C.E. Schmidt) Buxbaum 植物更多的照片這里可以看.